Ao Nang, often confused with Krabi itself, is actually the vibrant tourist centre of Krabi Province and offers the quiet atmosphere of a small town, the charm and beauty of a beach location, all the modern comfort and the unquestioned friendliness that makes Thailand a special and unforgettable place. The town has not a very large area, most services and hotels are situated along either the main beach road or on the short side streets and a 30 minute walk is enough to get you from one end of the beach to the other. 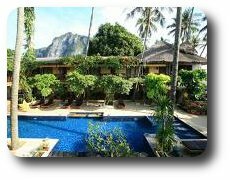 In Ao Nang there is a wide range of accommodation, from simple traditional wooden bungalows to luxury 5 star spa resorts. Ao Nang is mostly a family and sports destination. Even if it's not is not characterized by a wild night life and young party travellers may quickly get bored, it still has a few relaxed bars and two nightclubs. For this reason Ao Nang is considered by many people the ideal compromise between a pristine but boring destination and a fun but polluted one. By road, Ao Nang is about 20 minutes from Krabi Town and Klong Muang Beach and a minute or two to Noppharat Thara Beach that hosts the pier where the ferries connecting with Phuket, Phi Phi, Koh Lanta and other main destinations are departing and arriving daily. From Ao Nang is also quite comfortable to visit fantastic and unique places like Phang Nga Bay/ James Bond Island and have access to entertaining activities such as Rafting, Kayaking, Scuba Diving and Rock Climbing. The main beach at Ao Nang is the primary departure point for boats to a number of places, including the nearby Railay (or Rai Leh) Beach which cannot be accessed by road because surrounded by impressive vertical cliffs, the so called “4 Islands”, Hong Island and the world famous Phi Phi Island. Ao Nang – the peaceful village in Krabi that people miss. Phuket too full during high season to enjoy a relaxing vacation? Heard others mention Krabi, but not sure what is there? Well the answer may just be as close as Krabi province across the bay on the mainland. The lovely, peaceful village of Ao Nang may be just the place you are looking for to spend some time away from the crowds. Due to its central location along the Andaman Sea and to its fabulous geography and multiple sporting opportunities, Ao Nang is currently one of Thailand’s best all-round beach destinations. It is predominately a family and sports destination. It does lack a wild nightlife and young party travellers will find it boring, it does have a few relaxed bars and two nightclubs for the more mature adults to enjoy. Many beach destinations get ruined by over-development and the resulting over-population results in excess of pollutants in the environment. But before reaching this situation there is an optimal state, where there are sufficient facilities, but a still ecologically-sustainable tourist population. Ao Nang is now at this point and represents an ideal compromise between a pristine but boring destination and a fun but polluted one. The southern half of the beach is not accessible by road, yet the town has a wide range of facilities, for example six Italian restaurants, which will keep most visitors happily occupied for a while. Ao Nang is active but hasn’t lost that laid back, friendly small-town feel; it is developed but still retains its original beauty and charm. Ao Nang has numerous spas, beauty shops and massage parlors to offer you a Thai full- body massage, lasting an hour and will cost around 250 Baht and, though you may feel that you have been pushed and pulled in improbable directions, you will feel rejuvenated afterwards. It is one of Thailand’s most exciting soft and extreme adventure sports destinations. The town’s location on the eastern coast of Phang Nga bay puts it within easy reach of all the fishing, diving and kayaking sites in the bay. Phra Nang Inn is one of Ao Nang's first resorts (built in 1987) which is why it's in one of the best locations, right on the beach and close to the everything. It's an old resort that has been renovated to modern standards but still has it's rustic charm. It is nestled under the limestone cliffs that Krabi is famous for. The resort is separated from the beach by a small path so there is no road to cross to get to the beach. It's ideal for kids who also have their own pool in the resort (there are two pools). Phra Nang Inn serves excellent seafood. Ao Nang Sunset Hotel is located on Ao Nang beach, at the north end, just steps from the beach. It's the perfect base for whatever you want to do in Krabi. During the day enjoy the beach or a local tour and in the evening stroll along the promenade past the local restaurants and shops. 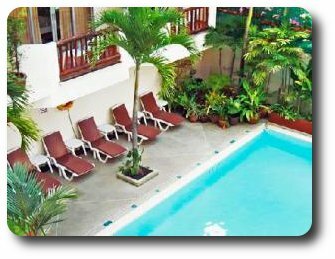 it is a small hotel of 3 star quality and offers good value for its location. Most hotels in this price range are not right on the beach. Request a room on an upper floor and have a view across the Andaman Sea. The hotel is spotlessly clean with all the facilities that you would expect. Ao Nang Sunset is a very popular hotel with families. Children under 12 stay free if sharing a bed with parents. Connecting rooms are available and the staff are friendly and attentive and on call 24 hours per day. Green View Village Resort is a beautiful tropical garden resort that offers seclusion without you feeling isolated. The resort is 15 minutes walk from Ao Nang beach (or 3 minutes drive in the free shuttle). The lush gardens create a relaxed atmosphere in harmony with nature and the dramatic limestone mountain views will refresh your senses. 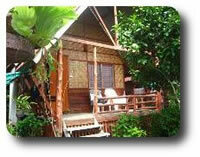 The rooms are all individual bungalows and there are different budget options available. You can enjoy the exotic flora and fauna from your balcony or from the open air restaurant pavilion.The large free form pool is surrounded by a wooden deck with sun loungers and sun umbrellas. A great place to relax. Ao Nang itself has two idyllic, unspoiled beaches, which are lapped by clear, warm water. Other, pristine beaches are located on a number of outlying islands which can be accessed cheaply and quickly from Ao Nang by local long-tail boats. Thai food is abundance and is available 24 hours a day. So be sure to visit one of the traditional Thai restaurants and stop by the local market to sample the wide variety of food or experiment with one of the many street vendors, who are based on every street corner. The smell and taste of the Thai dishes are enhanced by a variety of fresh, local ingredients; just don't forget to ask for non-spicy (mai pet) if you have a delicate, Western palette. For those people who need a break from Thai food, a whole host of Western options are available in Ao Nang; these include traditional English food, Indian Food, Scandinavian food, steaks, pizza and pasta (there are 6 Italian restaurants). Ao Nang offers a wide range of activities and attractions, including snorkeling, kayaking, island-hopping, climbing, diving, spa/massage/beauty, shopping, white water rafting, hiking, kayaking, snorkeling, temple visits, fishing parks, elephant trekking, cooking classes, massage classes, market exploration and fishing. Nopparat Thara beach is good for children and is only a few minutes away from Ao Nang. In addition there are numerous offshore islands, some of which are not too busy, even in high season. You can schedule a 4 island tour that leaves from the beach in Ao Nang. The ferry service leaves at 3:30pm from Had Nopparat Thara pier and costs 650B, Children 3- 10years old at 500 Baht. Private taxis will take you to Phuket town for 3000B. Contact us to book. To catch a public bus to Phuket you must first go to Krabi bus station. The public bus service leaves Krabi bus station hourly and takes 3 hours to reach Phuket. This trip costs 170B but the roads are very windy and it is a most unpleasant experience. There is a much more enjoyable option available in the form of direct speedboat transfer to Bang Rong pier, which is 2/3 of the way up Phuket’s coast. From this pier taxis will take you into the town for 100B. The speedboat leaves at 11am and travels across Phang Nga bay, winding its way through the multitudinous karst islands that rear sheer from the sea. It is a beautiful trip which arrives at 12:15pm and costs 950B. Contact us to book. From Phuket to Ao Nang, the ferry leaves Phuket town at 8:30am and arrives in Ao Nang at 10:30am. The public bus leaves every hour to Krabi for 170B. See the above section entitled Ao Nang to/from Krabi for how to get from Krabi to Ao Nang. The speedboat leaves Bang Rong pier at 3pm returning to Ao Nang at 4:15pm. Contact us to book. Note: In the low season (May-November) only the over land option is available. Lots of beautiful natural settings and activities, both on the mainland and the offshore islands. Nice Hotels, perfect for families. Offshore islands are National Parks and there is an entry fee. Very small area (walk side to side in 40 minutes). Shopping limited and expensive ( half the businesses closed during low season). Very tourist oriented place, not a sample of real Thai life. .Not a good place for pack backers or bargain hunters.